According to George Barna, there have been approximately 75,000 books on parenting published in the past decade. I sometimes feel like I have read all of them. It strikes me, though, that publishers must feel the same way and that, hopefully, they think hard before releasing yet another book into such a crowded marketplace. I at least wanted to give the benefit of the doubt to P&R with the release of William Farley’s Gospel-Powered Parenting. And I’m very glad that I did. The purpose of the book, as you might gather from the title, is to focus on the gospel as the most important power in parenting. It is not the parents–their efforts, prayers, hopes, dreams–that ultimately ought to shape parenting. Instead, it is the gospel of Jesus Christ. This is the power that needs to be at the center of all we are, all we do, as parents. 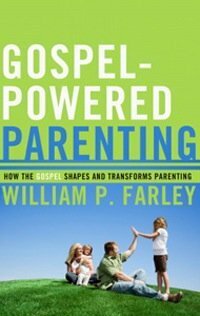 And this is exactly what Farley teaches through the 230 pages of Gospel-Powered Parenting–he shows how to apply the gospel to every aspect of parenting and, further, how the gospel is really foundational in all that we do as parents. We cannot effectively teach or discipline or care for our children if we ignore the gospel. This is the message of the book and it is one we, as Christian parents, do well to ponder and to heed. Second, Farley pushes back hard against the growing seed of Christian isolationism that advocates removing our children from the world as the sure means of protecting them from the world. Instead, he teaches that a good offense is the best defense. “A defensive mind-set worries about the evil influence of Halloween, Santa Claus, the Easter Bunny, or non-Christians on the Little League team. Although parenting always involves some protection, this should not be the main focus for biblical parents. Often this defensive mentality is the fruit of legalism. The legalistic parent usually assumes that his or her children are born again. But this parent has little confidence in the power of the new birth. Therefore, parenting is all about protecting children from evil outside influence.” Later he writes, “This book will assume that effective parents equip their children to overcome the world–not by changing and controlling their environment (things external to their children), but by going after their children’s hearts.” This is a very important message and one I have rarely seen in other parenting books. And third, he is relentless in pursuing fathers, teaching that it is the father who is primarily responsible for parenting children. It is the father to whom Scripture addresses all instruction in regard to raising children and it is the father to whom almost all books on child-rearing were addressed until recent times. It is the father who bears the heaviest burden of responsibility. Of course mom is intimately involved in each aspect of raising godly children, but it is dad who is ultimately responsible. And again, this is a message rarely taught today. These three messages, and others like them, set this book apart. I wondered, as I closed the cover, “could this be the best book I’ve ever read on parenting?” Perhaps it is not in an entirely objective sense, but what I do know is that it told me exactly what I needed to hear at this moment and did so more than any other parenting book I’ve read. It had just the right combination of affirmation (your struggles are universal struggles, your joys are universal joys) and exhortation to both encourage and challenge me in all the right ways. I highly recommend it to any and every parent.